These spyshots were sent in by reader Din. Finally, some signs of an all-new new Nissan model in Malaysia! Many of you have seen these two cars around with Singaporean number plates during the Chinese New Year festive season, as their Singaporean owners come back up to Malaysia to visit relatives. I’m talking about the Nissan Latio sedan and the Nissan Latio Sport hatchback. Both a Nissan Latio sedan and a Nissan Latio Sport hatchback have been spotted with trade plates going around Genting with their Nissan badges covered with cardboard and sticky tape. This could mean our choices in the circa-100K and below market will be expanded by the end of this year with the introduction of these two models. 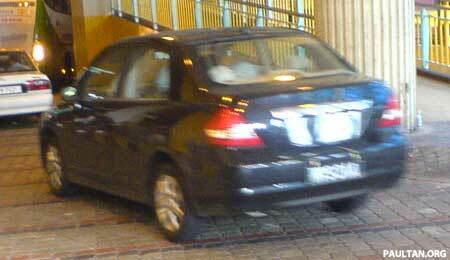 This shot is a little blur, but it shows the same black Nissan Latio sedan in the first photo, but there is also a greyish Nissan Latio Sport tailing it. If you look at the promo image after the jump from Nissan’s Singaporean website, you can see both cars clearly undisguised, with the same colours as the ones driving around in Genting. In Singapore, both the Nissan Latio sedan and Nissan Latio Sport hatchback are powered by 1.5 litre engines – the new generation HR15DE making 109hp at 6,000rpm and 148Nm of torque at 4,400rpm. The relatively high RPM at which peak torque kicks in worries me a little, as it might cause the Nissan to have a very Campro-like driving experience, so if there are any Singaporean readers who have driven this car and would like to give feedback, you’re very most welcome to do so. 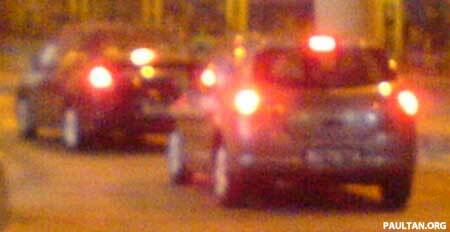 In the USA, the same car is known as the Nissan Versa, and comes with a 1.8 litre engine mated to a CVT gearbox. A new model in Nissan’s range is seriously quite overdue, as more than a year ago Nissan told The Edge Daily that it’s plans for 2006 was to launch a new luxury sedan and a luxury crossover SUV, and while some say the new Teana test drives are already available, there’s no official launch yet. It is 2007 now. Read this post dated 22nd February 2006 or this The Edge Daily article. This Nissan Latio sedan and hatch duo will most likely be the equivalent to the Toyota Vios and Yaris, or the Honda City and Jazz, which essentially are sedan and hatch versions of the same car.